Not only was Dave an amazing DJ, (seriously, people were busting moves I have never seen before) he was such an amazingly supportive and helpful member of the team on our big day. There were so many moments where we would say "it'd be great if..." or "can someone... " and Dave was right there ready to help. He worked closely with our sound and lighting people throughout planning and he gave us amazing sweet/ thoughtful advice on our planning call. WE LOVE DAVE. YOU'LL LOVE DAVE. HIRE DAVE and avoid all those cheesy/ lame/ chicken dance loving wedding DJs that you've seen at other weddings. We had an absolute blast with Dave! When we initial met, we sat and talked through what we were looking for and he was able to pick up and run with it! Multiple guests were requesting the playlist for the night because they had so much fun, which we were able to oblige because Dave was able to record the whole ceremony and reception for us to revisit. Can't recommend enough. When the lights came up at 11 everyone was still ready to boogie! Dave is the best!!! You should hire him right now. His music selections kept everyone dancing, and I got compliments from people of all generations. He kept it smooth and groovy with zero cheesy DJ vibe. Dave took command of the night so we could relax but was never obtrusive. He even helped us set up our audio for our outdoor ceremony, which was a life-saver. I would recommend Dave to any couple looking for a wedding night of high spirits. We communicated via Skype because I live out-of-state, and he didn't miss a detail. Throughout our back-and-forth, I felt like Dave had everything under control, which was very comforting for a bride managing multiple vendors. He asked us questions I didn't even think about and was a great listener. The final result was a harmonious mix of songs we picked out as our favorites and Dave's professional mixes. Finally -- and this is a minor thing -- but I really liked Dave's DJ table set-up. He arranged these trendy branches and lightbulbs to obscure his wires, etc., and they added a classy touch to our ceremony space. I cannot recommend Dave highly enough!! We hired Dave to DJ our wedding and could not have been happier! The music was amazing and we and all of our guests had a fantastic time on the dance floor. It was the perfect way to celebrate the occasion! Dave was also very flexible and friendly throughout the evening; he's the best! Dave - Thank you for everything last night! You were amazing and so accommodating- and your tunes kept people on the dance floor! We received so many compliments about you today! We all had so much fun! Thank you! Dave - I just wanted to touch base with you and tell you how amazingly happy we are that you were a part of our wedding day. All of our guests had a blast. We received so many compliments on the music selections. You were an absolute hit, and so many people told us and our parents that it was the best wedding music they've heard. :) Scott and I really do appreciate you and everything that you do! I heard Dave for the first time at an event at the Rustbelt Market and he was unforgettable. He was playing all of this music that I loved but had never heard. I made sure to introduce myself and get a card. My fiance and I eventually decided to hire him for our wedding, at the Rustbelt Market (very full circle)! We met with Dave one time before the wedding and felt so comfortable and assured that he would play exactly what we wanted without us having to tell him exactly what that was. He understood the type of music we loved, and considering that we are both professional musicians, this was very important to us. The fact that he plays about 90% on actual vinyl is such a major plus as well, it really adds something to the music and the experience. A group of 30 or so of our friends and family stayed very late and had a major dance party and Dave just kept it going, one song after the next; we just couldn't stop. It is one of the memories we will cherish most about our wedding day. Best dance party ever. Dave is undoubtedly an amazing DJ with great taste in music. We were lucky enough to have Dave DJ our wedding and reception, and he was awesome! From the very first time we met, Dave really took the time to understand both our wedding day vision and the type of music was important to us. Dave ultimately created an incredible and personalized set list that captured both what we wanted and a some fantastic surprises of his own. During our reception he played motown and soul - all on vinyl! Our guests still tell us that it was hands down the best music they had ever heard at a wedding! It really was a great dance party, and Dave even had non-dancers doing moves that they didn't even know they could do! Throughout the day, he went above and beyond to help with our entire event. He was one of the first people there in the morning, and one of the last to leave. Dave is extremely professional, easy going and creative, and we now consider him a friend. When he played "Save the Last Dance for Me" at the end, we were really sad that our day was over, but "oh so happy" that Dave had created the perfect soundtrack for our wedding. 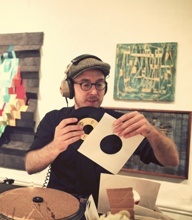 My husband and I met Dave while we were vending and he was spinning records at the 2011 Detroit Urban Craft Show. We realized halfway through the first day of the event that Dave was playing all of our favorite songs, and were thrilled that he was willing to travel to Kalamazoo in June of 2012 to be our wedding DJ. Dave is professional and fun and has a super rad setup that looked great amidst our reception decor. We could not have been happier with the experience he provided us, and if you are in the market for a DJ, look no further! Dave Lawson is the best there is! "If you need your party started, Dave Lawson is your go-to DJ. As part of Handmade Detroit, we've utilized Dave for his music know-how at the Detroit Urban Craft Fair and other crafty events. Dave never fails to find just the right songs for the audience. It's not uncommon to see shoppers dancing down the aisle as Dave starts a new record." "Dave loves music and can craft a DJ set to take an audience places. He keeps people engaged without overpowering their experience and can amp it up just at the right moments. What makes him different from most is his unstoppable desire to learn about artists, songs, labels, genre, cross-overs, history, pop culture, engineering, all with his technical ear. It's been a pleasure working with Dave on a regular basis. To anyone that is willing to make music a unique element to their event, you can breathe easy if Dave Lawson is in charge as DJ!"